Home Documentation What is the Duration Simulator? The duration simulator allows you to alter the length of your experiment by modifying the statistical significance level. This is the measure of how confident you can be in your final results. 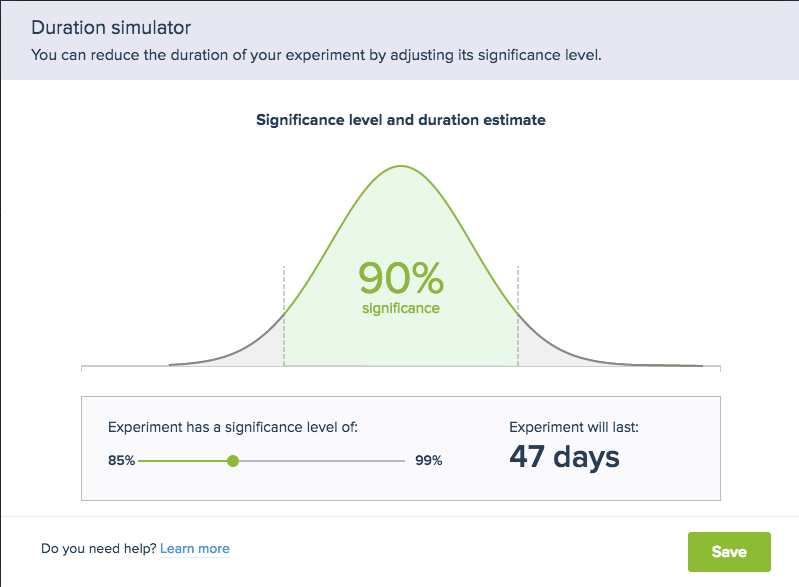 Longer tests with more visitors provide results that are more reliable; our Duration Simulator calculates how long a test must run to achieve the desired statistical significance. This means that a test with an 85% level of significance indicates that you can be 85% sure the final results are accurate. Conversely, there is a 15% chance that the conclusion is unreliable. Running a longer test will reduce this level of uncertainty, and Convertize allows you to set any significance between 85% and 99%. 4. The estimated duration is more than 60 days. However, once you have set a custom significance level, a link to the simulator will always be available to alter it regardless of these conditions. Let’s say we run a test with the hypothesis: “Having a bigger ‘Buy Now’ button will increase my conversion rate.” We ten use our sample (all visitors for the duration of the test) to work out whether a bigger “Buy Now” button increases conversions. What should I set my statistical significance to? The default setting for each experiment is 95%, and this is the level of statistical significance we recommend. However, websites with a higher amount of traffic will reach this level more quickly than those with a relatively low number of daily visitors. Therefore, you might opt for a lower significance level in situations where you want to get quicker results.